Combine all ingredients (except bell peppers) with hands until everything is evenly incorporated (not too loose or too firm). Stuff the prepared peppers ½ - 1 cm below the top (in cooking, the stuffing will 'raise'). If there is some leftover mixture, make medium-sized meatballs that can be cooked together with the stuffed peppers. For the tomato sauce briefly sauté garlic in olive oil in a large, deep pot. Add all the other ingredients, stir. If necessary, add more water (depending on desired consistency of the sauce). Place the stuffed peppers (and meatballs) in a pot, top openings up. Bring the sauce to the boil, then reduce the flame and simmer, covered, for about 45 minutes or until meat and rice are completely tender. Serve with the sauce and mashed potatoes. 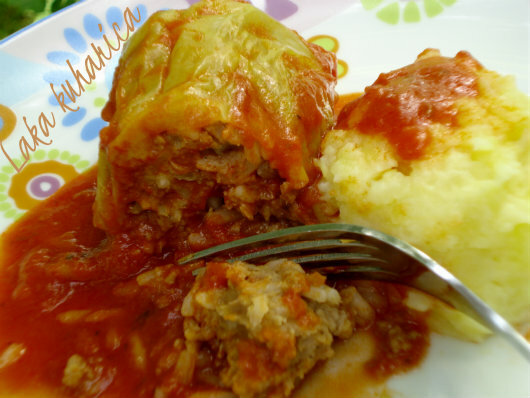 Traditional dish from Croatia eaten in summer and fall.